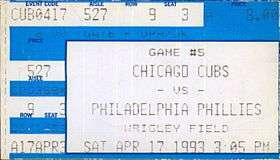 The 1993 Chicago Cubs season was the 122nd season of the Chicago Cubs franchise, the 118th in the National League and the 78th at Wrigley Field. The Cubs finished fourth in the National League East with a record of 84–78. December 2, 1992: Steve Lake was signed as a Free Agent with the Chicago Cubs. December 8, 1992: Dan Plesac was signed as a Free Agent with the Chicago Cubs. December 9, 1992: Randy Myers signed as a Free Agent with the Chicago Cubs. December 18, 1992: Willie Wilson was signed as a Free Agent with the Chicago Cubs. February 8, 1993: Steve Lyons was signed as a Free Agent with the Chicago Cubs. March 28, 1993: Steve Lyons was released by the Chicago Cubs. June 1, 1993: Heathcliff Slocumb was traded by the Chicago Cubs to the Cleveland Indians for Jose Hernandez. June 3, 1993: Brooks Kieschnick was drafted by the Chicago Cubs in the 1st round (10th pick) of the 1993 amateur draft. Player signed July 22, 1993. June 3, 1993: Steve Rain was drafted by the Chicago Cubs in the 11th round of the 1993 amateur draft. Player signed July 5, 1993. July 30, 1993: Karl Rhodes was traded as part of a 3-team trade by the Kansas City Royals to the Chicago Cubs. The New York Yankees sent John Habyan to the Kansas City Royals. The Chicago Cubs sent Paul Assenmacher to the New York Yankees. August 19, 1993: Glenallen Hill was traded by the Cleveland Indians to the Chicago Cubs for Candy Maldonado.